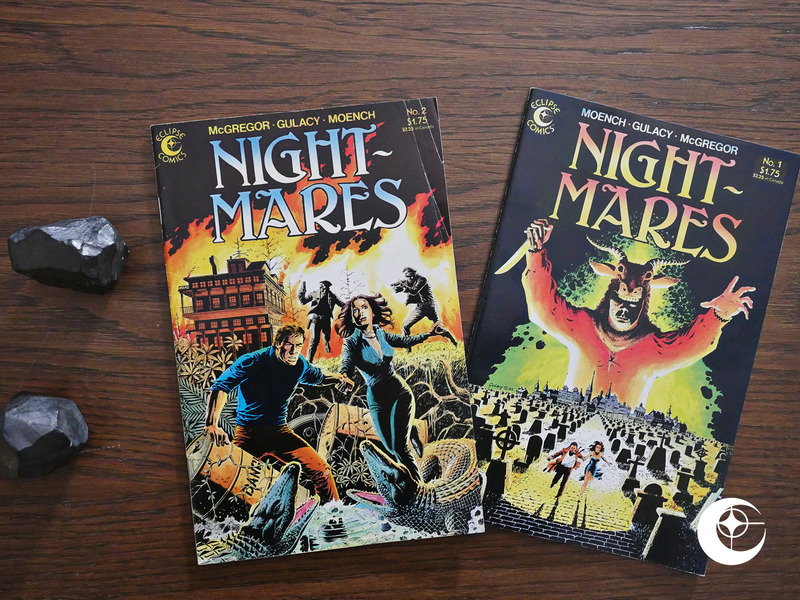 Nightmares (1985) #1-2 by Paul Gulacy, Doug Moench, Don McGregor, et al. 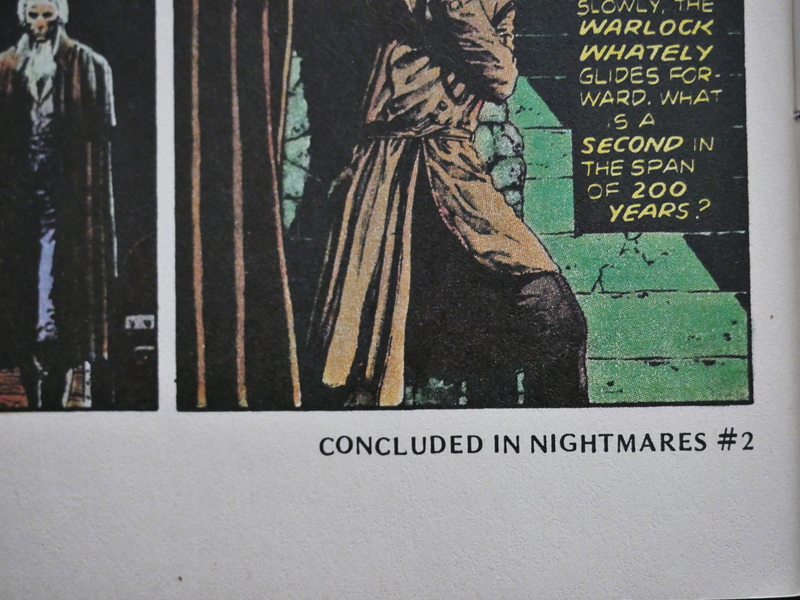 These two comics were published on a biweekly schedule (that is, 14 days apart) and reprints two serials published in Eerie Magazine (published by Warren) in the late 70s. It’s a rather strange thing to do, but Eclipse did a lot of this stuff that year. All the artwork is by Paul Gulacy, but the first serial (a damp, southern one (with added nuclear waste disposal conundrums)) is written by Don McGregor. 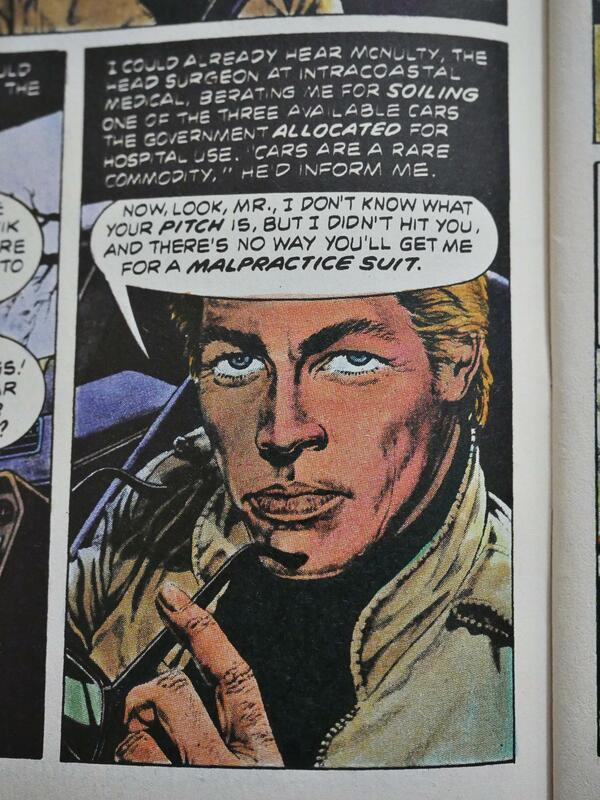 It was originally printed in black and white and at magazine size, so it’s been shrunk and coloured (by Steve Oliff). And some of it survives the transition very handsomely. I guess the originals were done in grey washes? 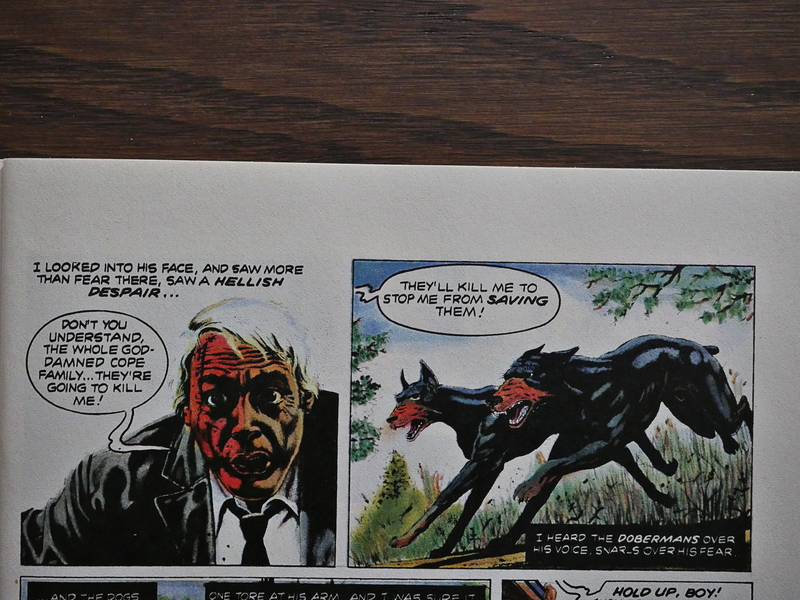 So the colour Oliff adds gives it a slick sheen, reminding me a bit of Richard Corben, perhaps. The lettering doesn’t fare so well. Many of these overwritten captions are a bit on the unreadable scale. Let’s see… “wander uncomprehending? in an? eternal? monogloid! twilight”. Yikes. Perhaps it’s better not to try to read the text. The other story is written by Doug Moench and is a take on The Wicker Man (no, not that version; the British one): Guy arrives in town and all the townspeople are downright sinister! The should see a minister. Both stories are told in vaguely eight page chapters, and both stories are spread out over both issues. Which is also a weird choice, I think: Why not just devote each issue to one story? 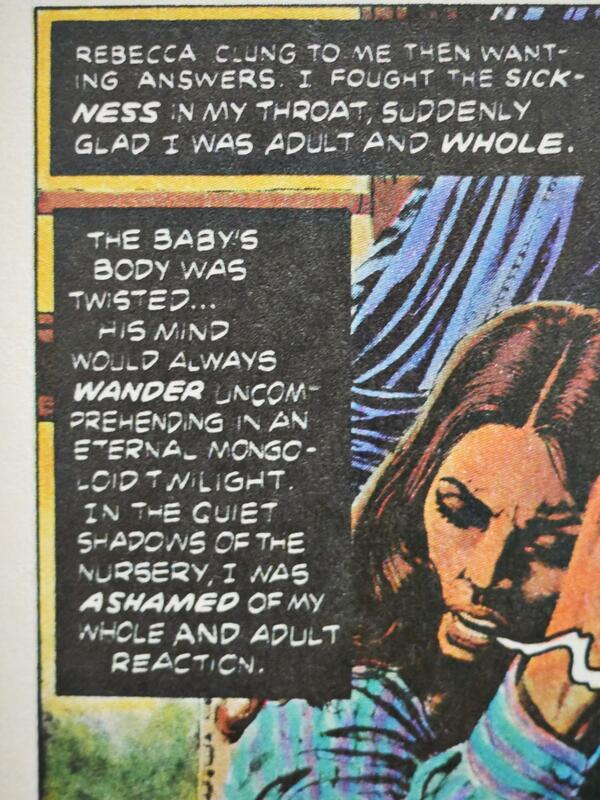 Gulacy’s artwork’s nice, but this is not these writers’ best work. Heh. 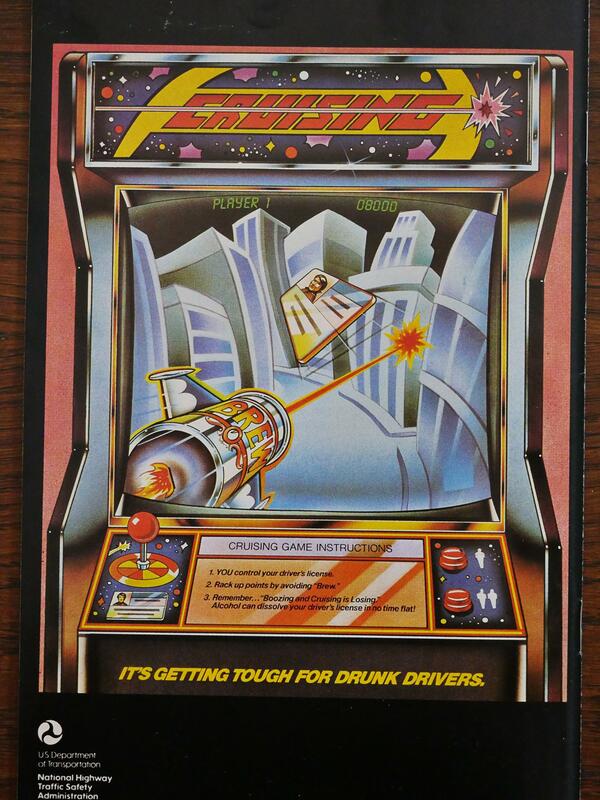 The back covers feature an anti-drink-and-driving campaign? They’re reaching out to the kids with that modern video game, I guess.